Water. Water is the primary symbol of baptism. John the Baptist used water (Mt 3:11; Mk 1:8a; Jn 1:33; 3:23), as did Jesus (Jn 3:22). Jesus is living water (Jn 4:10), and when Jesus died, the water that flowed from his pierced side serves as a wellspring of his life and grace (Jn 19:34). The usual method is infusion, for water to be poured over the head. Baptism can also be done by partial or full immersion. Water is a symbol of divine life, grace, new birth, growth, power, deliverance, cleansing and the covenant. Oil. Oil is also a symbol of baptism, and two kinds are used. The Oil of the Catechumens is used after the prayer of exorcism and applied to the chest. It represents salvation as well as the strength and power that come from Christ our savior. After the water has been poured, Sacred Chrism is used to anoint the crown of the head, and it represents salvation, participation in the priesthood of Christ, membership in the body of Christ and a share in eternal life. Baptismal garment. The baptismal garment is a white garment either worn from the beginning of the ritual or given after pouring or immersion. It is an outward sign of the person’s Christian dignity. It also signifies that the person has become a new creation and has been clothed with Christ. Candle. The baptismal candle is lit from the Easter Candle. The candle represents the risen Jesus, who is the light of the world (Jn 8:12). Jesus is the light that guides every baptized person. It also represents the flame of faith, which is to be kept burning brightly. Dove. The dove is a symbol of the Holy Spirit. When Jesus was baptized, the heavens were opened and the Holy Spirit descended upon him in the form of a dove, and every person who is baptized receives the same Holy Spirit. Jesus baptizes with the Holy Spirit (Mk 1:8; Jn 1:33). Flame. A flame is another symbol of the Holy Spirit, which came down as tongues as of fire on Pentecost (Acts 2:3). Jesus baptizes with fire (Mt 3:11b; Lk 3:16). Baptismal font. The baptismal font is a large basin, usually placed on top of a pillar or stand, but it may emanate from the floor. Years ago it was customary to place the font in a baptistery, a separate room apart from the body of the church, but today it is more common to position the font in the entryway or a prominent location within the church. Holy water fonts are often placed at the doors of the church where the baptismal font is not located, or in chapels or peoples’ homes. The holy water recalls the waters of baptism, and when a person makes the sign of the cross, it recalls the baptismal formula. Seashell. A seashell is sometimes used to cup and pour the water during baptism. 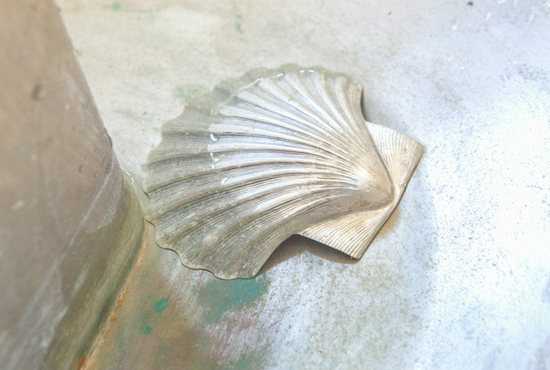 It is one of the most common symbols of St. James, who reportedly used a seashell to baptize his converts in Spain. The seashell is often pictured with three drops of water, which represent the Trinity. Chi-rho. A chi-rho, or a cross, is often displayed on the font or other items associated with baptism. The “chi” is the Greek letter equivalent to the English letters CH, and the “rho” is the Greek letter equivalent to the English letter R, and together are the first two letters of the Greek word for Christ. Both the monogram and the cross represent Jesus, in whose name disciples are baptized. Fish. A single fish represents a baptized person, a group of fish represents the community of believers, and a net represents the Church, which keeps the members together and protects them (see Jn 21:11). A fish also represents the new life of grace that a person receives in baptism. Three fish arranged in a triangle or a circle represent the Trinity. When Jesus commissioned his disciples to go forth and baptize, he instructed them to use the Trinitarian Formula: “In the name of the Father, and of the Son and of the Holy Spirit” (Mt 28:19).